Tomato soup that doubles as sauce! Tonight, I had a hankering for tomato soup. Not that over-pureed gunk out of a can, but a nice, homemade soup with a bit of texture to it. Apologies to those who are fans of the stuff out of cans; I’m not a lover, I fear. As soon as I got home, I started pulling ingredients out of cupboards and the fridge, seeing if I had all the ingredients. Add butter and oil to a Dutch oven pot over a medium heat. Once the butter and oil are hot, add the celery, carrots and onions. Cook until onions are just turning translucent and are soft. Stir every now and then. Add the pepper paste, basil, oregano, garlic and pepper. Give it another stir. Raise the heat slightly and deglaze with the wine, scraping up anything which may have stuck to the bottom of the pot (flavour!). Pour in tomatoes and tomato juice. Stir in the soy sauce, vinegar, Worchestershire, sugar, barbecue sauce, pesto and bay leaves. Bring to a boil. Lower heat, cover and simmer at least 20 minutes. In a separate pot, boil up your favourite pasta (if you want a heartier meal) and drain & set aside once it’s done. Remove soup from heat, give it another stir, pulling out the bay leaves as you do. With an immersion blender, blend up all the contents of the pot until you get your desired consistency. Pour in milk or cream and give it another quick blend. Serve hot over noodles. Sprinkle cheese or serve with wedge of brie to melt in the soup, if you so wish. 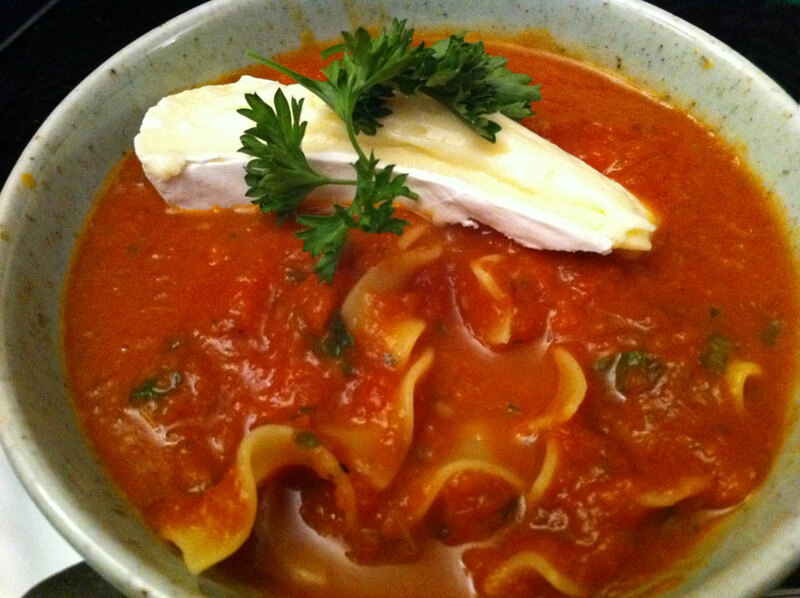 This entry was posted in dinner, experiments, Lunch, recipe, soups and tagged basil, brie, carrots, celery, cheese, cream, garlic, milk, noodles, onions, oregano, pasta, pepper, pesto, puree, rice wine vinegar, soy sauce, sugar, tomato juice, tomatoes, worchestershire sauce. Bookmark the permalink.